I was collateralized once before – in the advertising sense, where my image got inluded in advertising material. It doesn’t bother me. I like the picture this time – I’m deploying my alligator. 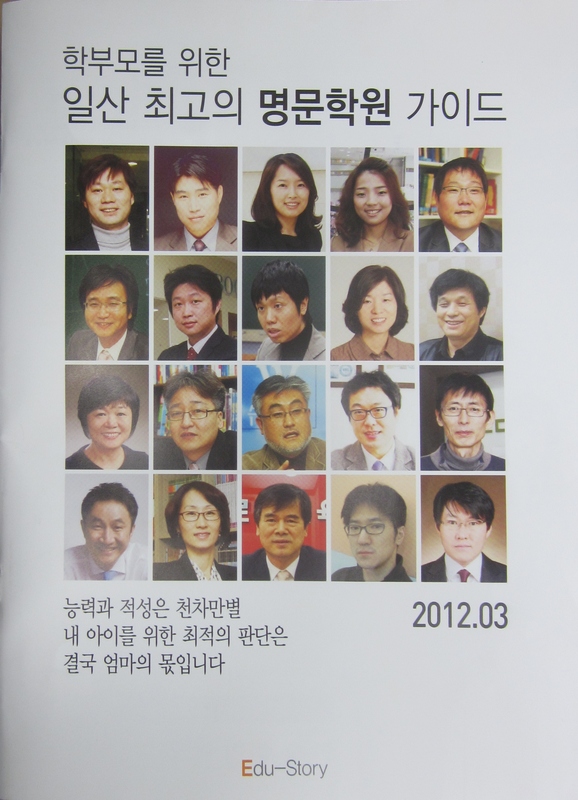 There’s a write up in an Ilsan area “trade publication” of some kind, about the hagwon biz. There’s a picture of the cover of the magazine, at right. The title is “학부모를 위한 최고의 명문학원 가이드,” which would roughly translate as Guide for Parents to the Best Hagwon [after-school academies] in Ilsan. The magazine is distributed at public school parent meetings. For some reason that our boss doesn’t understand, Karma English Hagwon is the first write-up in the guide. This is extremely lucky, from an advertising perspective. There’s a two page write up on Karma Academy, with yours-blogging-truly, alligator to hand, on the second page. Here’s a scan of the two pages. You can see our entire staff (yes, it’s a small hagwon). There were a bunch of children down the hall behind me yelling when we took the picture – because they were all in their classrooms unsurpervised. Very exciting moment. The picture of me with the alligator is slightly ironic – because that is perhaps my single most difficult student there, facing the alligator. You can click the below image if you wish to embiggen it.